I am loving the Christmas Blogging Challenge and today - I'm doing two days in one. Yesterday as you know, I forgot to hit publish - so I had to make sure the Wonderful Pistachios Christmas Giftaway was posted first! Today's prompt is "Best Gift You've Ever Received". The best gift I've ever received is a tie - but there's one special little girl who may always take the top spot. Chanel wasn't a Christmas present, but a birthday present. 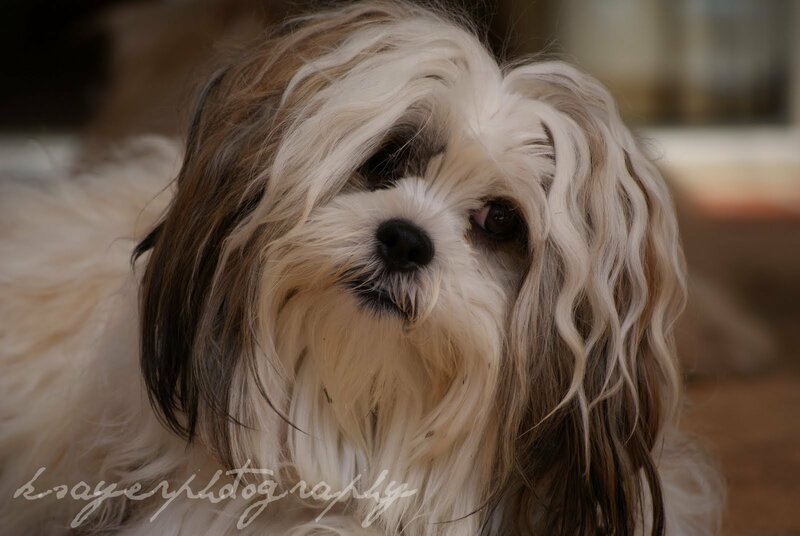 My parents had spotted Chanel at the pet store with her scruffy little brother and knew straight away I'd love her. They come home and said "we nearly bought you a puppy today" and I freaked out. My Pa immediately piped up and said "BUY IT! I'll buy it!" and before I knew it, we were in the car racing to the pet store. I saw her and fell in love. She was a tiny little bunch of fluff with big beautiful eyes and the lady quickly had her in my hands to see if she liked me too. That little pup crawled all over me and wouldn't leave my side. I wanted her so bad - but then at the same time, being the cautious person I am, I wanted to think about it and make sure I wasn't wasting my Pa's money. Why I even needed to think about anything, I'll never know now! She is the gift that makes me smile and laugh every single day and she is the sweetest little thing you'll ever meet. All she ever wants to do is cuddle and the second you walk in the door she will fuss over you like you're Jesus on Earth - and makes sure she greets you with one of her favourite toys. But, I want to give a gift to you! Did you think I had too many competitions already? I didn't! With the goodies, you'll be able to try one of Lola Berry's healthy recipes - like her grain free soaked cinnamon muesli with banana and maple syrup. I often bake with Almond Breeze (and use Almond Breeze as a Dairy Free/Vegan Milk Substitute in my recipes). Almond Milk can be used to substitute any type of milk - from regular cow's milk to soy or rice milk and it can be used in any recipe or food. The texture of Almond Breeze is just like milk - so it's perfect for using when cooking sauces, baking or when baking soups. Unsweetened Almond Breeze can be used in any recipe, but it's perfect for savoury dishes - whilst the Original Almond Breeze is sweetened and is perfect for baking. PLEASE NOTE: I will need a way to contact you if you are the winner. Please be sure to leave your email address or email me at southerninlaw@gmail.com. Make sure you leave a separate comment for all of your additional entries! Competition closes Monday 7th January, 2013 at 11:59am EST. The winner will be chosen by a random generator and notified by email. This competition is only open to Australian Residents. Kristy does not endorse any of the information provided in the 20/20 Diet nor does she endorse any diet. You should always seek the advice of a medical professional in regards to any health condition or concern. steamed almond milk with Loving Earth coconut butter - best hot chocolate ever! Subtle yet sweet, utterly enticing. Perfect for that hot summer's day kick. I'd love to make a banana smoothie with almond milk- I haven't had a chance to have Almond Breeze actually, only 'So'..and that was sadly sweetened and tasted like sugar! I'd love to try the unsweetened versions especially! Soak your oats, vanilla essence, honey and cinnamon in Almond Breeze. Leave to set in fridge overnight. In the morning, sprinkle some chia seeds, handful of almonds and sliced strawberries into your overnight oats. This make for a perfect, healthy and nutritious breakfast and is unbelievably yummy! Mix it up by replacing the strawberries with other fruit (blueberries, raspberries and bananas make great substitutes). banna, strawberry, yoghurt, armond milk into a blender, done. Adding Almond Milk when I make Almond biscotti, great for the festive season and to give as a gifts as well. I use Almond Milk in my smoothies. My favourite is banana, honey, wheatgerm and almond milk, with a big spoon of icecream. Yumm. Almond milk braised chicken and asparagus is a meal that hass all the kids coming back for seconds. I don't eat animal products, so I use almond milk as a substitute in most recipes. My favourite is Banana Protein Muffins recipe on your site. My boyfriend is on a high protein diet at the moment and loves these as a post-workout snack. I usually substitute chickpea flour in place of plain flour because it's quite a bit higher in protein and gives it a really nice texture. I love oats with Almond milk in the mornings! Cook 1 cup of rolled oats with 2 cups of Almond milk in a pot on slow heat until oats are ready, transfer to a bowl, add a few chopped organic dates. Yumm!!! On a whim one summer's night, with not much food in the house, I brought together some random ingredients and came across a culmination of food fit for the gods! I cooked some chicken in a wok, slowly marinating it in almond milk and then glazed it with honey in the oven. Served with fresh vegetables and rice. A true sensation of taste. Almond, beef mince Chimmichangas! Which are wrapped parcels of yummies in soft boritoes, oven baked - Almond heaven. 1. Fill bowl with gluten free cinnamon chex. 2. Pour over almond milk. 3. Devour. I love love love making Oaty Chocolate Chip Cookies... Almond Milk, Oats, Coconut Oil, Baking Soda, Brown Sugar, Agave & Chocolate. HEAVEN!!!! Rice pudding / Creamed Rice with Almond milk is divine!! Topped with fresh fruit to make it even more yummier! Coconut Cream and Orange Mocktail! I use Almond Milk over my cereal, I find it gives it a fresh taste that is so different to normal milk. Turn Cous Cous into a dessert by adding almond milk, poached plums and a lightly toasted crumble to finish - it's delicious, healthy and terribly moorish! Thanks for the great comp! My family loves Almond milk Cookie Dough popsicles, so easy to make and taste amazing! Emailed my email address to you. Already like Almond Breeze Australia and Southern In Law on Facebook! I love almond milk in my smoothies, the health benefits alone are wonderful. Mixed with banana, strawberries, yoghurt and raw egg, its delicious. 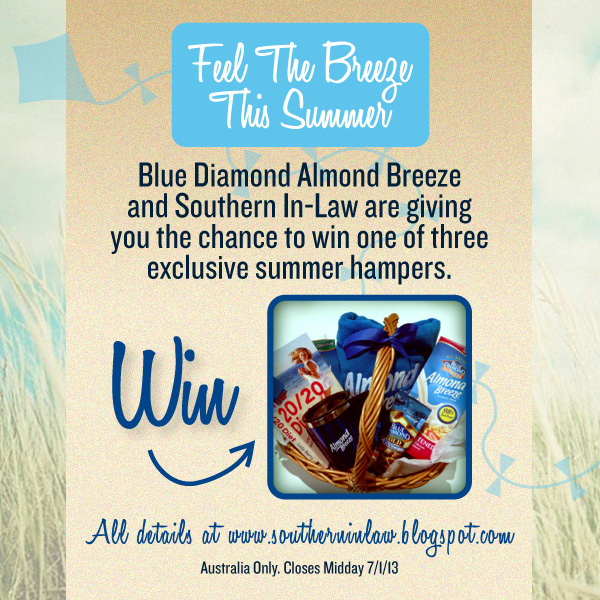 I like Almond Breeze Australia and Southern In Law on Facebook! Almond meal mixed in with chocolate topping is perfect on ice cream. Meant to say liked Southern In Law on Facebook! my favourite recipe is to use alamond milk in banana bread. so moist! I love using Almond Milk in nutty chocolate icy poles treats for the kids! Blend 2 cups of Almond Milk, a heaped tablespoon of Nutella and 3 heaped tablespoons of Milo. Poor into ice block trays and freeze! Yum! make that icy pole treats! I love making Vanilla Almond Milk Latte's, yum. I make a terrific fruitcake using almond milk, fruit & flour, and that is all and it always tastes fantastic and very moist. Your baked banana oatmeal recipe......I can finally stomach the old podge. I have liked both on Facebook. Love caramel chocolate vanilla ice cream with almond breeze either clld or put in microwave has a really yummy taste can add cinnamon sugar bit of nutmeg or have ginger nut biscuits yummier. I would love to try Almond Milk Chocolate Pudding. I haven't tasted Almond Milk yet, I am very eager to try! daryakhomich@y7mail.com. I am a liker of both required pages. daryakhomich@y7mail.com. I have shared this competition. :-) daryakhomich@y7mail.com. Belinda belinda_mouk@hotmail.com An almond milk smoothie with banana,tofu,natural peanut butter and honey. I love making my morning smoothies with almond milk. Banana, protein powder, berries, LSA and almond milk thrown in a blender. Delicious! Have liked both Almond Breeze Australia & your page! Have shared the competition and tagged both pages. Have tweeted the comp and tagged both :) And emailed you my email address! Thanks. Hi, I made the baked banana oatmeal for my baby and toddlers and they all loved it so that one is a real hit with us. To be honest I've never tried Almond Breeze. I'm trying to live a healthier life. I would love to win one of your Summer hampers. have like Almond Breeze and your great page. Avocado soup made with almond milk sounds yammy! I have liked both pages - oliatitova@y7mail.com. Have shared this competition, too! oliatitova@y7mail.com. afedorov@y7mailcom. Thai Sweet Potato Soup - just delicious! afedorov@y7mail.com - I have shared this giveaway! I use almond milk in smoothies - yummy! An African friend got me on to Seffa, a combination of almond milk, sugar, cous-cous and dried fruit. Highly recommended.